Hello, everyone! 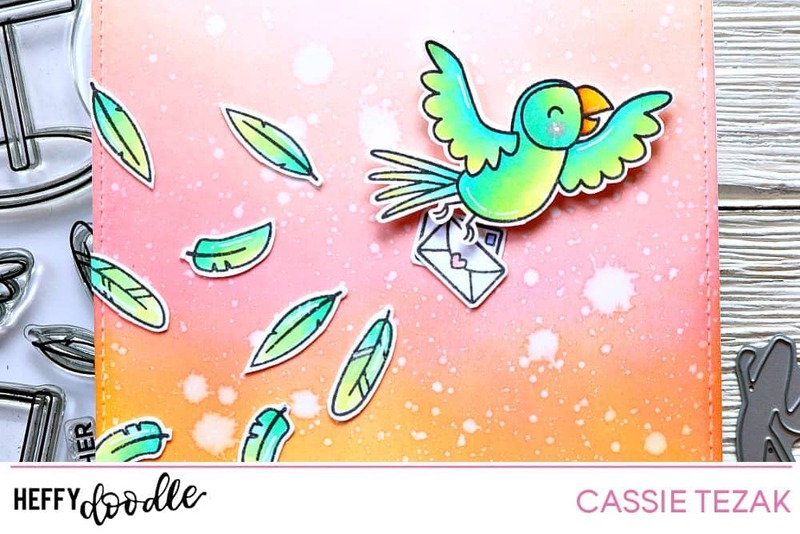 It’s Cassie here, and I’m so happy to be back on the Heffy Doodle blog to share a card with you 🙂 I hope you’re all having a great week! I am so excited that it’s almost the weekend because that means more crafty time! 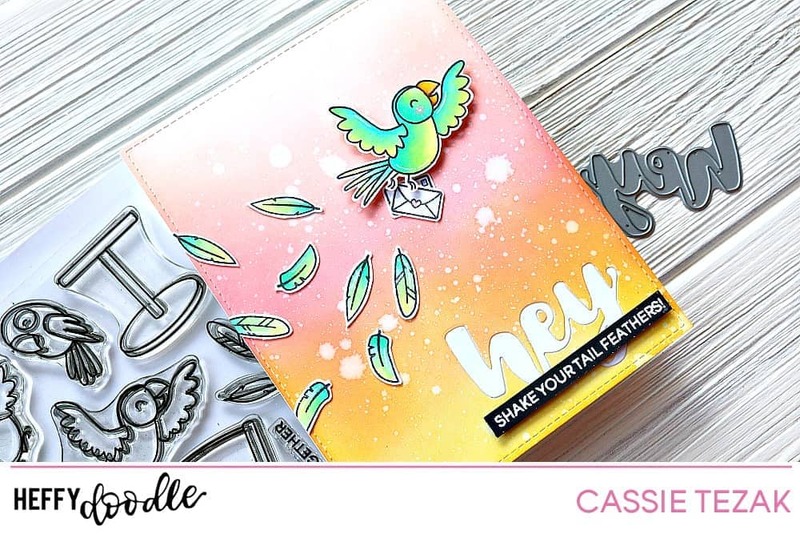 Today I’ve got a card using some great Heffy Doodle products and some of my favorite techniques. Let’s take a look! To start out my card today I stamped out one of the birds from the Wingman set as well as a few sets of the feathers to be colored in. I went with a bright Copic color combo, using a mix of greens to give him a really fun look. Doesn’t he just look so happy? I decided I wanted him to be holding something, so I stamped a couple envelopes from Yappy Mail and gave them some color as well. Next I die cut the stitched rectangle from the Clover Frames die set from some 80lb Neenah Solar White paper. I grabbed the Distress Oxide colors Wild Honey, Worn Lipstick and Tattered Rose and started blending them over the piece of paper. Once it was blended how I wanted it I sprayed it with water to get those awesome water spots you see. It’s one of my absolute favorite things to do to add interest to a card. Once that was dry I die cut the Hey die from the lower right corner to set up my sentiment. I arranged the feathers so that they trailed behind the bird and adhered everything to the card panel. Then I attached the whole piece to a card base, and inlaid a white hey die to where I cut the one out of the distressed panel. 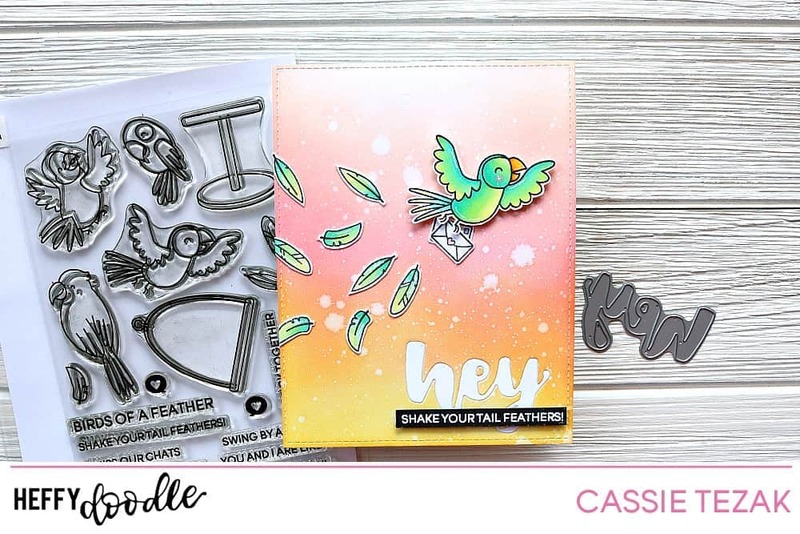 To finish my sentiment I heat embossed the ‘shake your tail feathers’ stamp on black cardstock with white embossing powder. I trimmed that down and added it to the card with foam tape. The final touch was to add some white gel pen accents to the bird and feathers. And that’s it for my card today! I hope you enjoyed it. Thanks so much for stopping by and I’ll see you again with another card soon! !